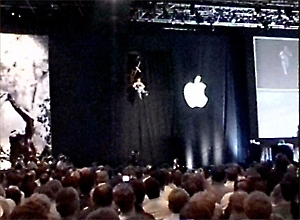 The video on the right is a personal clip shot from the standing room only crowd - unlike other previously seen versions. 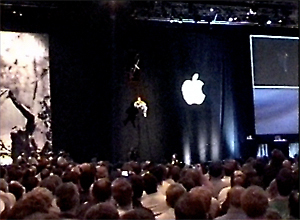 Steve Jobs' sidekick, lackey, or henchman, Apple Senior Vice President of Marketing Phil Schiller takes a death-defying dive to enter, in Steve's words, "the DEMO Hall of Fame". The original tangerine iBook was using Phil Schiller as protection, transmitting data from its USB attached accelerometer so that everyone could see the dangerous shock that Phil suffered. Note that the height that he leaps from is pretty high and that he lands on a rather small inflatable mattress - not much room for error! 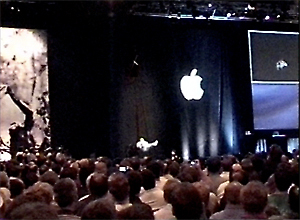 My FAVORITE MacWorld EXPO Keynote Address. Steve Jobs at his best. Steve Jobs finalizes Apple's 4 point product strategy. The original iBook, aka "iMac to Go". Wraparound flying saucer power adapter. This was the HISTORIC moment when most of the world was introduced to "wireless" (WiFi) - watch and listen as the sro crowd gets up on their feet and goes wild! Steve Jobs wakes the iBook from sleep and innocently demonstrates web surfing using the iBook; unbeknownst to everyone is that he is doing so wirelessly... until he picks up the iBook and continues to surf the internet while walking around the stage! 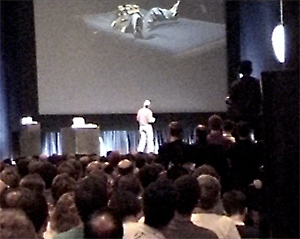 Steve Jobs comically demonstrates the wireless capabilities of the original iBook with a HULA HOOP! 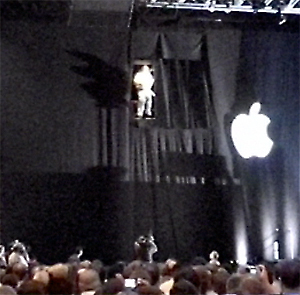 Steve Jobs' sidekick (or henchman) Apple Senior Vice President of Marketing Phil Schiller takes a death-defying dive to enter, in Steve's words, "the DEMO Hall of Fame". Page 1: Steve Jobs' iBook wireless demo with a hula hoop! Page 2: Phil Schiller's death dive stunt.